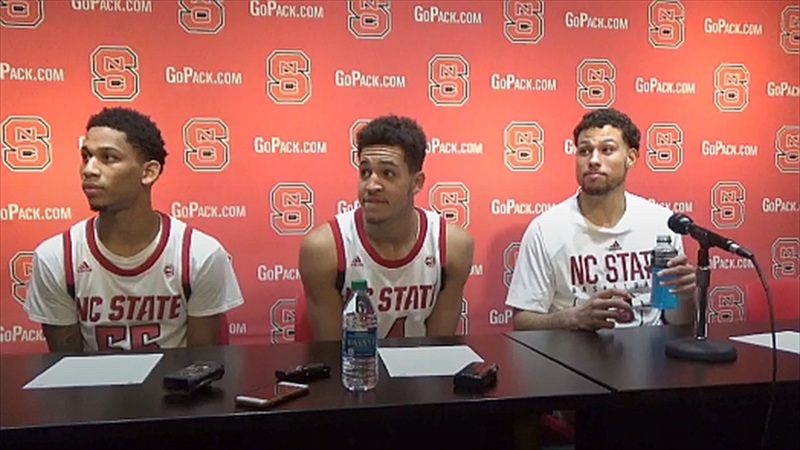 Blake Harris, Jericole Hellems, and Devon Daniels met with the media after the Wolfpack's 100-67 win over Western Carolina. It was a great experience. The feeling that the fans are right on the court...I like it a lot. There’s like a lot of energy in the gym, and I think we all felt that, so I liked it a lot. I wouldn’t even call it that. I think I was just overthinking it. I was just worried about trying to get comfortable, just overthinking it way too much. I just settled down, kept it simple, and trusted the offense. It came a lot easier. I just kept on listening to my coaches, putting in the work, and it helped a lot. I think everybody knows about his story, but to actually play for the school he represented, it’s a different meaning. You can definitely tell how much of an impact he has on the community, and it was a great experience playing here, playing for him and the fans. As a team, I think we’re trying to have the mind state to stay consistent playing versus anybody but definitely playing against ranked teams in different arenas. We always get excited about that, and it’s another chance to prove ourselves and get better, so I think we’re definitely ready and we’re definitely excited for it. I think we’re growing every game, and the more we compete together and we know each others tendencies and stuff like that, (the more) we feel like we’re going along well. Like you said, we’ve played some really good teams and some ranked opponents, and I think all that has helped us bond. We’re just going to keep on getting better. It being my first time playing in (Reynolds), I think it was first of all a blessing and then just an amazing experience to have the support from the fans and have it be so loud. I enjoyed myself. Just knowing the legacy that he created with the team that he coached, I think it’s a blessing to just have NC State across your chest. Knowing the history behind it, I think just having this opportunity to play with NC State is a blessing. I think like Blake was saying, we’re all just creating bonds and having fun with each other and trusting in each other. I think it showed tonight that we played well together throughout any circumstances, and the next game is going to be the same way. Playing at Reynolds was a great time. This is my first time. It’s a great crowd, a lot of intensity. I liked it. I thought it was wonderful that we got the win on the day they changed the arena to his name. His former players were here, so I thought that was cool that they could see us play. It was a blessing. I think our bond is amazing as a team. I think we all stick together, and we’re not selfish at all. We’re like brothers, and we just want to win and make Coach Keatts happy.